Yaraka – The End of the Line? Not only is Yaraka the end of the line, it has disappeared off the map! I’ve been searching for a map to show you just where it is and Google has decided Yaraka is to be a secret. Fortunately, Wikipedia recognises the name and puts it in its place! Yaraka is no secret to ‘grey nomads’ though, it’s a place that is mentioned around the campfire where tall tales and true are shared. What makes Yaraka so special? Why the Yaraka Pub of course! The Yaraka Hotel is much more than a good place for a reunion though. This tiny town, with a permanent population of 12 people, is full of community spirit. While I was there the Dubbo South Rotary Club brought the participants in their Expedition Outback rally to Yaraka – 130 people turned up and the ‘town’ catered for them, both dinner and breakfast. Some achievement by such a small group! The rally was supporting the Pink Angels for their Yaraka stopover and they dressed for the occasion. Apart from my wonderful catch up with Gerry and Chris, another highlight of my visit was the bus trip to Mt Slocombe that Chris does in the evening, just in time to catch the sunset and the changing light over this magical landscape. Chris is passionate about the area and conveys this to the group as he talks about its history and the things that make Yaraka such a special place. This photo shows the tiny township of Yaraka viewed from Mt Slocombe nestled at the foot of the Yang Yang Ranges. If you would like to know more about the history of Yaraka this link will fill you in on the details, particularly why it is known as the End of the Line – a grand plan literally stopped in its tracks! As more properties erect dog proof fences they are gradually restocking the land with the sheep that made Yaraka so prosperous in the past and moving away from the cattle that replaced them. Yaraka is truly the hidden gem of Outback Queensland with a fascinating history, breathtaking landscape and locals that will make you fee like you’ve found home all over again. And I guess that’s why so many travellers make their way back to Yaraka time and again – just like I’m going to do! Categories: Australia, Camping, Queensland, Travelling | Tags: camping grounds, Chris & Gerry Gimblett, solo travelling, the Outer Barcoo, travel, western Queensland, Yaraka, Yaraka Hotel | Permalink. And the whispering of the trees. – Until you hear the gennies ROAR! And leave a campsite quite divided. Or turn on cooling air. As nature intended them to be. Gennies should be ‘out of bounds’! Categories: Camping, Poetry | Tags: bush poetry, camping, camping grounds, generators | Permalink. I stopped in Kununurra only to shop and then I was on my way to Wyndham. Between the Gibb River Road turnoff and Wyndham I saw a sign to Parry Creek Farm camp ground so I thought “Why not” and headed down a very corrugated dirt road for about 10 kms to this lovely spot where I set up camp and stayed for 6 nights. Margaret & Nev turned up after detouring to Lake Argyle and then spending a couple of days in Kununurra. They were in time for the Camp Oven Cookout where I was the ‘entertainer’ with some bush poetry. For doing this I was given a free meal (saved $18!). There was a group of twitchers (birdwatchers) camped here at the same time as this is one of the areas where Gouldian Finches have been seen, particularly around the Lagoon. Unfortunately they didn’t make an appearance for us but we did identify quite a few birds we hadn’t seen before and Margaret got some great photos. I love these of the Rainbow Bee-Eater. And this next sequence shows an egret finding, catching and eating what we think was a frog! Could be something tasty here! Think I’ve just found dinner! I’ve got my eye on it! On the road in to Parry Creek there is a turnoff to the Marglu Billabong, which has a bird hide – and also some enormous resident crocodiles that laze on the banks (a bit too far away for a decent photo though). The very rough, rocky road takes you up over Telegraph Hill which got its name from the original telegraph station whose ruins are still there. Brutus excelled himself in 4 wheel drive, up over the steep hill and over the corrugated dirt road. The old telegraph station is only a shell now …. …and then you are over the hill and down to the billabong. The bird life here was amazing and through my little binoculars I could see some VERY big crocodiles – salt water ones – they’re the dangerous kind! They hauled themselves out of the billabong to sun on the bank. I was glad they were so far away! We left Parry Creek for a couple of days in the Wyndham Caravan Park which gave us the opportunity to see some of the sights around Wyndham. It’s a funny little town, split in two parts a few kms apart – the main part where the caravan park is and then the port area. At the caravan park there was a bird feeder hanging outside the little cafe area and these bright Red Winged Parrots that Margaret photographed were constant visitors. As with most places in the north the ground was dry and dusty but I enjoyed Wyndham and loved discovering some of its history. The pioneer cemetery held the graves of many workers who had died during the construction of the Meatworks, which was a major industry in Wyndham earlier in the century. 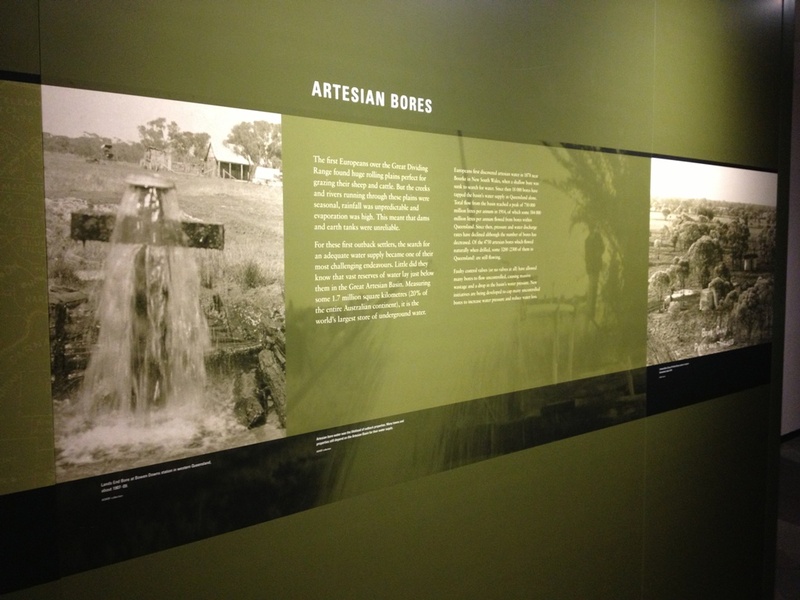 The Wyndham museum is a credit to the local community. It not only has artifacts and other memorabilia of the past but dozens of books the locals have compiled with interviews of past residents which really gives you a ‘hands-on’ feel for what life was like in their time. I was amazed to see a copy of the Instrument of Surrender of the Japanese forces here. I had never seen, or even heard of this before! It also was a source of great horror to me with many stories of how the local aboriginals were treated during the settlement of Wyndham. 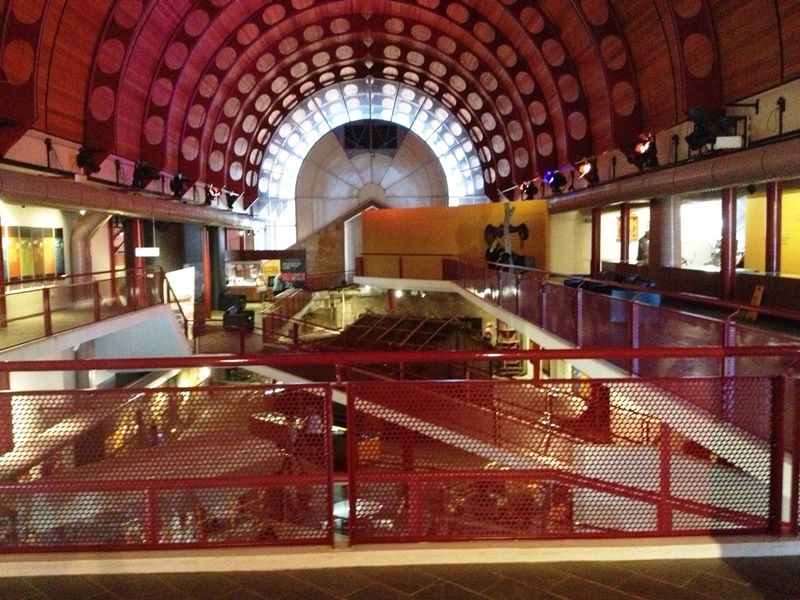 Here are some snippets of info the museum had – made all the more interesting by the volunteer on duty the day we visited! I also went to the ruins of a place called The Residency. It was built for the magistrate in 1888 but has never been lived in – he refused to go there because it was too remote and the aboriginals were unfriendly…. when you read how we treated them, no wonder! Anyhow, it was also built with the wrong mortar and it started to crumble and fall apart before anyone could live in it. There is a wonderful lookout up a very steep and windy road with lots of hairpin bends called Five Rivers Lookout. It has spectacular views of the five rivers; the Ord, Forest, King, Durack and Pentecost Rivers; which enter the Cambridge Gulf and surrounding mangrove swamps, mudflats and hills. Brutus crept up and down this lookout in 1st and 2nd gear but I have to say the slow climb up and down was worth the views from the top. I’ve just about given up drinking since leaving Alice Springs – you can’t buy cask wine anywhere, bottle shops are only open for short hours, there are police checking ID at every liquor outlet, and in most places you can’t buy any alcohol over 2.7%, which restricts you to light beer. When you can buy wine, it’s expensive so I just drink my tonic water and pretend it’s got gin in it …. I’m sure it’s not doing me any harm! What’s Wyndham famous for? The BIG CROCODILE! But I also loved the Boab Trees, which will dominate our landscape for a few more kilometres yet. The port township of Wyndham is almost deserted but it has a wonderful little cafe called The Rusty Shed which served great coffee. Here’s a few photos of other sights around Wyndham. An interesting town and I really enjoyed my few days here. Categories: Australia, Camping, Travelling, Western Australia | Tags: bird watching, Boab trees, camping grounds, crocodiles, egrets, Five Rivers Lookout, Marglu Billabong, Parry Creek Farm, solo travelling, Telegraph Hill, Wyndham, Wyndham Museum, Wyndham Port | Permalink. 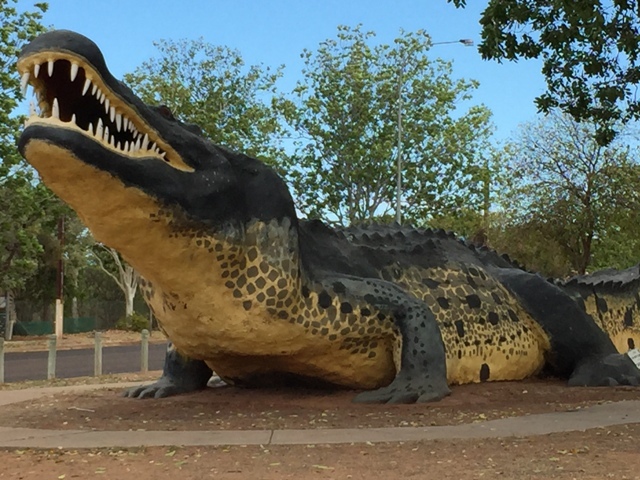 Longreach to the Channel Country- so much to see and do! I thought I’d spend a couple of days in Longreach, but I drove straight through and went to Ilfracombe and stayed in the Ilfracombe Caravan Park. What a great night! They have a fantastic Happy Hour Shed and the night I was there they did a Sausage Sizzle in aid of the Royal Flying Doctor Service. It was a great way to meet even more wonderful people. Their regular entertainers were away at the Yellowbelly Classic in Longreach so we entertained ourselves with jokes and bush poetry from the crowd. I plucked up the courage to tell my Green Frog poem, which went over really well. 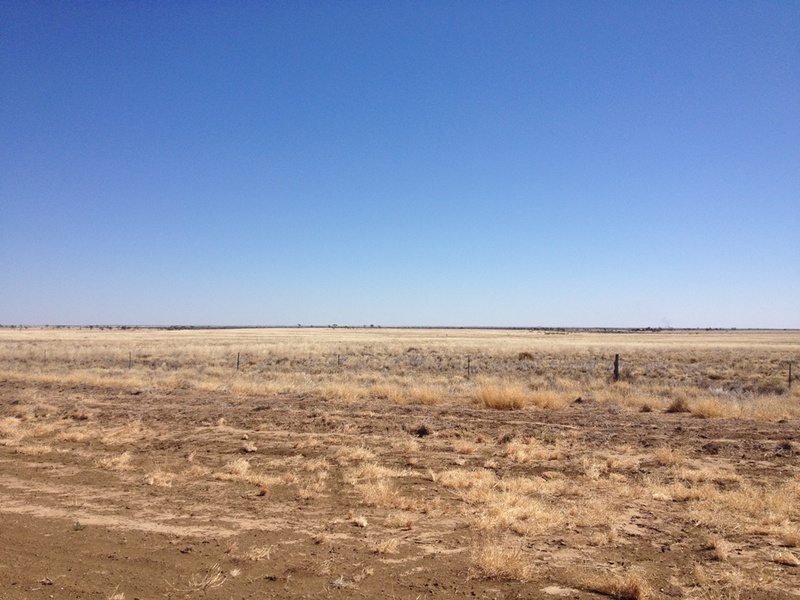 I started back to Longreach late the next morning, making the most of the power to charge my lantern, computer and phone – and to catch up on some blogging. I arrived at the Longreach Stockman’s Hall of Fame and paid my money to see the museum. I have to say I was disappointed in the museum. Although filled with an amazing amount of information it was very sterile, I found the displays quite dark and hard to see the artifacts, and if you aren’t a reader you would miss so much – there is a lot of reading! I had missed the live stockman display in the arena out the back as I got there after 11am, so that was disappointing, too. Perhaps I just wasn’t ‘in the zone’ for Longreach so I definitely have to go back and give it a fair go. I would like to visit the Qantas museum and also do the river cruise or wagon trip which I have been told by other travellers are both fantastic experiences. Next time. After filling up with petrol and refilling my gas bottle I headed south to Stonehenge, 151kms away. I was entering the Channel Country in the Barcoo Shire. 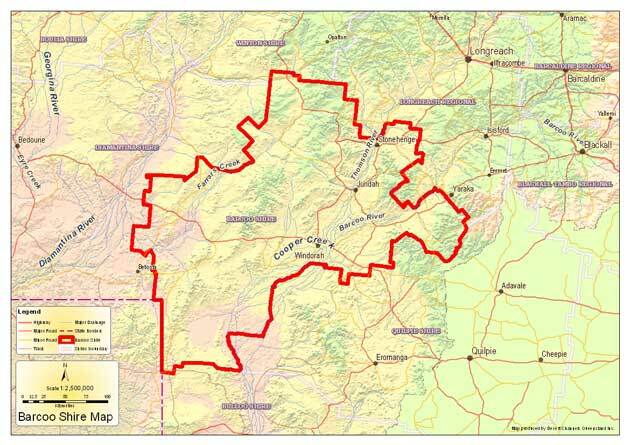 If you want to get an idea of the size of this shire, think approximately the size of Tasmania – 61,974 square kms. It takes in the townships of Stonehenge, Jundah and Windorah. The little caravan park at Stonehenge offered showers, water and power for a $10 per night in the honesty box. The Community Centre opposite is also the Information Centre and a very friendly lady was more than happy to fill me in on what to see in the area. 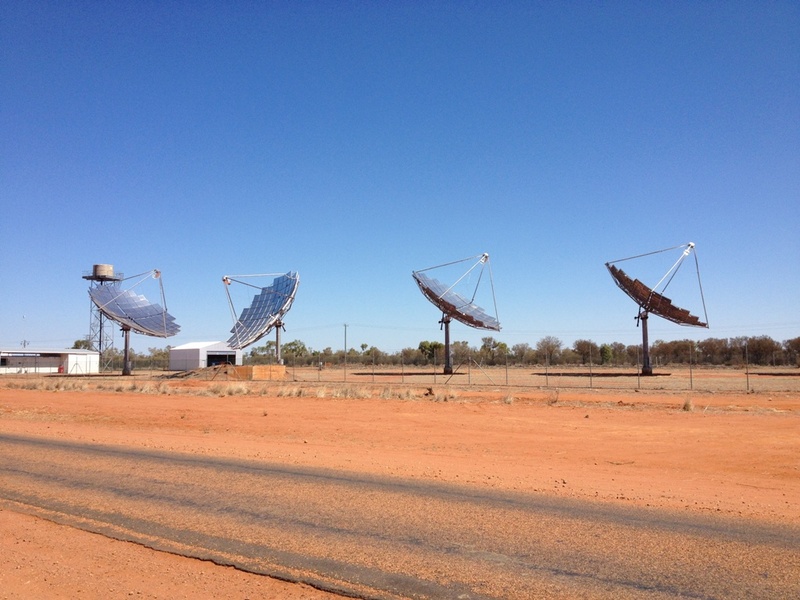 The same facilities can be found in Jundah and Windorah for the same price. Each of these little towns also has a dump point. I stayed 2 nights at Stonehenge and whacked the lantern on charge again to make sure I had plenty of light for the free camps I would be staying at over the next few days. You can get too comfortable when you are ‘plugged in’! Jundah had a lovely looking free camp on the banks of the Thompson River but I decided to keep going to Windorah, where I stayed at the free camp at Coopers Creek. Coopers Creek is formed by the joining of the Thomson and Barcoo Rivers and when in flood it fills multi channels and flood plains that stretch outwards from its banks for up to 100kms as the water commences its journey to Lake Eyre. Windorah has a solar farm that provides most of its energy requirements and looks so out of place in this little country town. The free camp is just out of Windorah on Coopers Creek. The best spots were taken when I got there but I found some shade, set up camp and not long after was joined by another person, Derek, who it turned out was from Swansea in Tasmania, a town close to where my sister lives. By the time he left I had to get out my lantern to see what I was cooking. Bugger me dead – it didn’t work! All this time I’d been charging it for a night just like this and it was the globe that was gone, not the charge! Out with the trusty head lamp, which I hadn’t used until now, and looking like an alien I cooked my dinner and then read by the same lamp until sleep time. I LOVE this little lamp. It’s hands free, throws a great light – and it cost next to nothing. I think Laurance convinced me to buy it at Crazy Clarks when he was in Mt Isa – thank you! 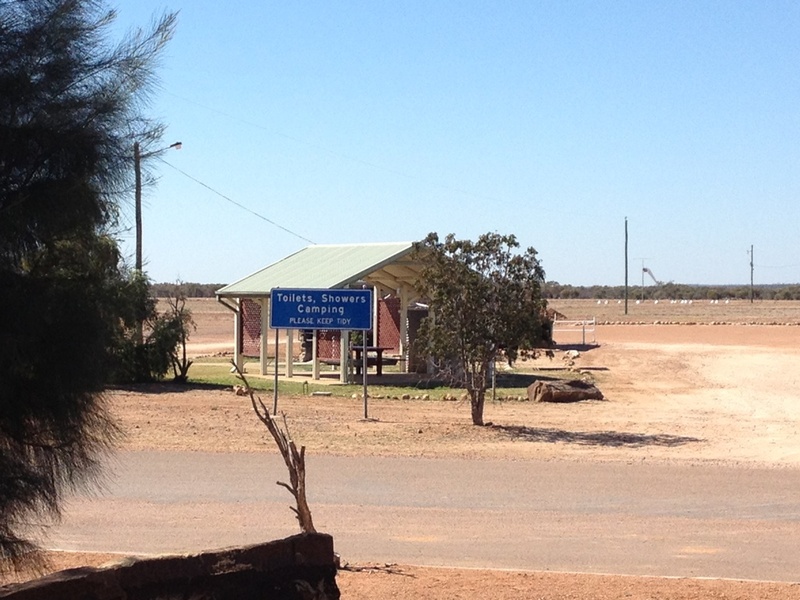 Tomorrow I’m going to Quilpie – but I’m missing Toompine, Eromanga and Adavale. I have to come back! Categories: Camping, Travelling | Tags: Barcoo River, campervanning, camping grounds, Coopers Creek, free camps, Happy Hour, Ilfracombe Caravan Park, Jundah, Longreach, Solos, Stockman's Hall of Fame, Stonehenge, Thomson River, travelling, western Queensland, Windorah | Permalink.